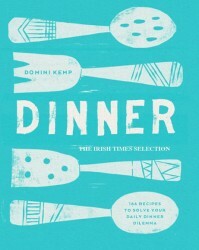 It’s a question we face every day and now Domini Kemp’s Dinner provides the answer. After poring over an archive covering six years of her much-loved Irish Times columns, Domini brings you the best ideas for the main meal of the day. With a strong awareness of the importance of eating healthy and nutritious meals, the recipes are quick and hassle free without compromising on flavour. Covering meat, poultry, fish and shellfish, and a wide range of vegetarian recipes, there’s something for every diner and every dinner. So the next time you hear that question, ‘What’s for dinner?’, remember: Dinner has got you covered. Be inspired!